The Pratt Engineering/Pullman Company property is an historic transportation and industrial complex, dating back to the country’s industrialization in the late 19th and 20th centuries. The Pratt Engineering Company purchased this property adjacent to the rail line in 1900 in what was once the City of Kirkwood. 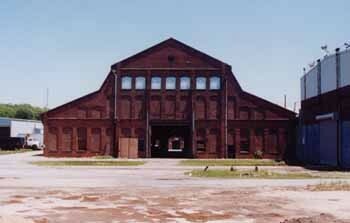 In the 1920s the Pullman Company bought and expanded the industrial complex for its southeast repair facility. Many of the industrial buildings, characterized by brick clad and riveted iron skeleton construction built by Pratt Engineering, and the brick clad reinforced concrete buildings built by Pullman Company remain on the site. In the 1990s the State of Georgia purchased the property for the operations of the New Georgia Railroad. Since the demise of the train service, there have been no clear plans for the use of the complex. However, many groups have expressed interest in the property and in some cases the buildings. In June 2017, the Georgia Building Authority selected a bid from Atomic Entertainment to purchase the site for $8 million. The developer intends to build a film studio on the site. The same month, the Atlanta Urban Design Commission approved a resolution nominating the site as a landmark district, resulting in an interim control period to prevent alterations and demolitions on the site. This moratorium is set to expire December 2017. City preservationists, including the Atlanta Preservation Center, hope that the moratorium will allow time to develop a preservation and redevelopment plan for the site.